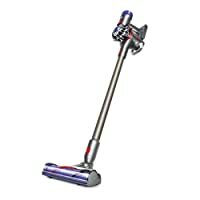 What to Consider when Buying a?Dyson Vacuum Cleaner? Pets are our greatest companions. Taking care of them is actually a daunting task as they shed lots of hair in the house making the whole place look ugly. Gathered hair can also lead to allergies and asthma as they contain harmful allergens and dust mites which are annoying for everyone inside the house. Thorough clean up is necessary for those pet owners who suffer from allergies as it can really be infuriating to tackle with the embedded hair in the carpets and furniture. Seeing the extra hair drifting around the room, kitchen and dining area feels weird for which you need a good piece of vacuum cleaner for dog hair. Also, because the vacuum cleaners are manufactured to deliver quality cleaning, it becomes important to invest in one. Always on hand, Dyson V6 is a superb cordless vacuum cleaner for animal hair. Manufactured to deliver a quality cleaning performance, this model has the potential to beat full size corded vacuums. Providing a hassle free experience, Dyson has the highest geometric average pickup performance. Also, it wipes off the dust on hard floors, creviced hard floors and carpets with utmost ease. With its direct drive cleaner head, it offers 75% more power on carpet cleaning. You can clean the house quickly and easily as it has cordless mechanism to give a hassle free experience. It offers up to 20 minutes of run time as with the powerful fade free suction, the pet hair gets removed effectively. For handheld cleaning, the wand quickly detaches and enables you to wander around the whole house easily. Also, the Dyson tools fit directly into the machine. To remove hair from car seats, tight spaces, from furniture and grounded dirt from the carpets, its mini motorized tool comes in handy. With the stiff nylon bristles, the cleaning becomes easy and also this handheld vacuum provides an easy grip down below and in between. To get this animal vacuum, you just have to spend somewhere around $350, isn’t it great? Powered by the Dyson V8 motor, this animal cord free vacuum makes cleaning an enjoyable experience. With the most powerful suction and up to 40 minutes of cleaning, this cordless vacuum offers hassle free cleaning. It makes sure to capture the allergens and dust mites from the air through the HEPA filtration system. Also, the air gets fresh and chemical free for asthma or allergy sufferers. For the difficult tasks, it has max power mode for up to 7 minutes that provides higher suction. Other than that, it converts to a handheld vacuum for spot cleaning and removing dirt and pet hair from toughest areas. When the bin is full, it can be emptied with the push of a single button without messing with the debris. With the direct drive cleaner head, it embeds the bristles deep into the carpets to wipe off grounded dirt. For the tough tasks, it has mini motorized tool and 2 tier radial cyclones to increase airflow and capture fine dust. To do gentle dusting of the house, it is equipped with a mini soft dusting brush which also provides balanced cleaning up, down, top and in between. Other than that, it has received the highest numerical score among stick vacuums. It also has a docking station, crevice tool and a combination tool in the accessory box. Grab this superb vacuum under $450 and take your cleaning to a whole new level. Dyson V7 motorhead cord free vacuum is a beautiful vacuum with gorgeous looks. This small pink colored vacuum is a delight to the eyes as well as the performance sets it apart from its counterparts. This vacuum deep cleans the carpets and hard floors with a powerful motor inside the brush bar. The stiff nylon bristles get deep inside the carpet pile to extract the embedded dirt and pet hair. This vacuum transforms the way you clean your home as it is cordless that makes it easy to clean and reach the hard areas. By offering up to 30 minutes of powerful fade free suction, this model has made it to the top 5 Dyson vacuums. Also, with its convenient docking station, it stores and charges the machine and holds other attachments effectively. To offer spot cleaning and quick cleanups, this Dyson transforms to a handheld machine. With a single push of a button, you can empty the dirt bin and there is no need to touch the debris to get your hands dirty. For easy cleaning around the furniture and under bed, it has a low profile cleaning head that offers outstanding clean up within minutes. To enjoy the super clean up experience, get this machine under $300. 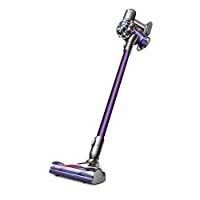 Dyson has launched this beautiful purple colored animal upright vacuum that promises to deliver a mind blowing performance. It has the strongest suction with more power to clean the toughest areas. No other vacuum can ensure to provide such powerful suction under an unbelievable price of $400. As it is ideal for pet owners, the ball animal 2 vacuum is equipped with an advanced self adjusting cleaner head to automatically adjust between hard floors and carpets. 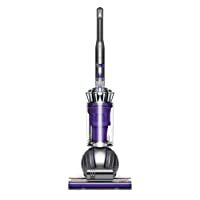 Without losing suction while switching between the surfaces, this vacuum has been rated as the top notch vacuums by Dyson. Also, to clean up high and under furniture, the wand and hose releases in one smooth action. Additionally, you don’t need to mess with dirt or debris as the bin is designed with a hygienic system that gets empty with a single push of button. Also, to trap the allergens and bacteria flowing in the air, the HEPA filtration comes in handy that remove all the bad chemicals making the air fresh and hygienic. Other highlights include a tangle free turbine tool (removes hair from upholstery in a tangle free manner), cleaner head, stair tool and a combination tool. Never to miss this vacuum as it is backed up by 5 year warranty period. Dyson Big Ball Animal vacuum is crafted for animal lovers, the name says it all. This vacuum cleaner removes all the dust, dirt, debris and allergens etc. from the house perfectly well. It is designed for homes with pets and is the only vacuum with zero filter maintenance. With HEPA filter, you can get rid of all the nasty particles and just with a single push of a button, the bin gets emptied. No need to worry about messing with the buttons or controls as it has a self adjusting cleaner head to clean any surface. With a fine array of attachments, this vacuum is a boon for allergy sufferers. Clean the floor, ceilings and walls etc. as it has the outstanding suction power and turbine tool to give an amazing cleaning experience. To remove the pet hair, this machine won’t get bogged down thus freeing you from that annoying coughing and sneezing. The instant release wand helps to clean up high in one smooth action and the multi angle brush ensures high reach cleaning. While it protects you from all pathogens, this one is leading machine under an unbelievable price of $500. Battery life of a vacuum is an essential factor to take care of. Go for a vacuum cleaner which has at least 15 minutes of battery life or else you will be stuck in charging the vacuum over and again. This is another important feature as you need to keep switching from carpets to hard floors to extract dog hair. So the vacuum cleaner you choose must have automatic height adjustments to make cleaning a breeze. Some vacuums are capable to clean the hard to reach areas like stairs, under the bed, around the furniture items and nooks and corners etc. While you choose any vacuum, make sure that it has a flexible and extended hose. Since most of the vacuums are easy to operate, emptying the bin can be problematic. The Dyson dust bins can be emptied with the press of a button so you don’t have to deal with the debris directly with hands. Isn’t really an awesome feature? Most Dyson vacuums are capable of removing pet allergens from the air using HEPA filters. These filters keep fine particles from being released which cause air allergies or asthma. It is suggested to choose a vacuum cleaner with HEPA filtration system that delivers hygienic and breathable air. Well, reviewing Dyson vacuum cleaners was a challenge as there are a lot of units with similar mechanism. Bringing these models to your knowledge was important as they neither are expensive nor cheap. Dyson V6 tops the list with handful of features at economical price whereas Dyson V7 is an ideal choice for start-ups. To deal with allergens or mites, Dyson Cinetic can be purchased but for that, you have to loosen up your pockets a little more. Rest, it all depends upon your requirements and of course the budget as to which unit you would like to buy. Make a decision, happy shopping!